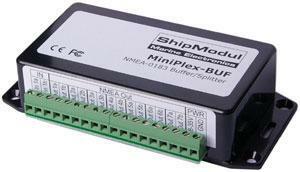 The MiniPlex-BUF is an advanced NMEA buffer/splitter featuring one input and seven outputs. It is designed to solve the problem of sharing NMEA data from one NMEA device with multiple other NMEA devices in a trouble free manner. The received NMEA signal is amplified to the proper NMEA levels, ensuring delivery of an NMEA signal to connected devices which meets or exceeds the specifications of the NMEA standard. Fully isolated inputs and outputs eliminate all ground loops. The outputs are short circuit proof, ensuring delivery of NMEA data to all connected devices in a reliable manner, independent of short circuits on one or more outputs. Commonly available buffers usually offer multiple outputs from a common – isolated – power supply. The outputs are isolated from the ships power supply, but they are still connected to each other. The MiniPlex-BUF offers full isolation on all outputs because each output has its own isolated power supply. This makes the outputs compatible with all sorts of inputs, whether they are isolated or not, differential (RS-422) or grounded (RS-232). The NMEA input is a galvanically isolated input, using a high speed opto-coupler capable of transporting data up to 38400 Baud. The input is fully compatible with the NMEA specification. This allows the input to work in a noisy environment and with long cable runs. The isolated input removes any ground loops that might exist between the connected device and the buffer. It also withstands any ground or common mode potential up to 1500V. The MiniPlex-BUF is equipped with 7 fully isolated outputs, each with its own opto-coupler and isolated power supply. This technology creates completely floating outputs which makes connection to any device an easy task. Each output automatically adjusts to the type of input it is connected to, whether this is an isolated, differential or single ended input. Connection to a grounded RS-232 input on a computer is no problem and does not influence other outputs. The MiniPlex-BUF offers three barriers against ground loops. The first barrier is on the isolated input, the second barrier is on each of the isolated outputs and the third barrier is on each of the isolated DC/DC converters used to power each output. A major benefit of completely isolated outputs is that a short circuit on one output has no influence on the signal of the other outputs. Signal delivery to connected devices is therefore guaranteed to the highest possible level. All these features makes the MiniPlex-BUF one of the safest and easiest buffers to install. Supply voltage: 8-35VDC, secured against reversed polarity.